Ann Arbor Golf Club article, October 20, 1899. It already has a hundred and forty members. This is one of the social clubs of the town and will provide a very pleasant social gathering point for all who either play golf or enjoy a bicycle spin on the road to the club house. The club began with 314 members. The land leased from Mr. Roberts was 40 acres of a farm. In 1903, the club purchased the land for $4,000. 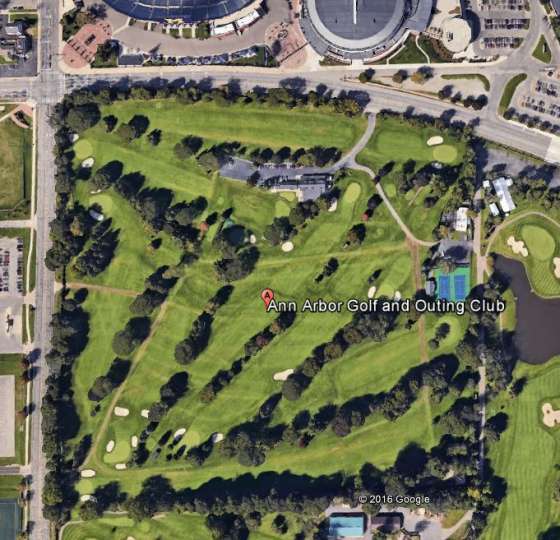 Today, the Ann Arbor Golf Club is the Ann Arbor Golf and Outing Club. It remains at the original location, just across the street from the University of Michigan Football Stadium and Crisler Arena, and adjacent to the University of Michigan Golf Course. It is a nine hole course, but can be played twice from different tees for a complete round. The Ann Arbor Golf and Outing Club is either the oldest, or second oldest existing club in Washtenaw County. The Washtenaw Country Club (now Polo Fields Washtenaw) had their grand opening in August 1899. That makes Washtenaw older on the basis of incorporation. The Outing Club, however, says that theirs is older because they played golf informally before incorporation. I suspect, however, that the same is true of Washtenaw. I have never had the chance to play the Ann Arbor Golf and Outing Club, but the holes I have seen as I played the University of Michigan course look very nice.